I know that this recipe is in the breakfast section but we had it last night for a quick and very easy dinner. The peach salsa is a lovely idea particularly now that we are in peach season and they ripen so quickly, a great way to use up those fruits that are less than perfect. The chickpea scramble is very tasty and so quick to bring together and could be used for lots of other dishes. I wouldn't have thought of the idea of adding miso to plant milk and adding this to the chickpeas at the end of their cooking, this left them really tasty and creamy too. Delicious. This is a great combination of veggies and along with the miso dressing is right up my street in way of flavours and textures. I substituted some of the oil for some runny tahini (and used less oil as I thought 4 tablespoons seemed a lot) and then added a little water to get it to the correct dressing consistency. I made this recipe into muffins instead of the bundt in the recipe (it made 10). The crumb is lovely and light (not like a lot of vegan cake batters) and the ganache made from sweet potatoes is totally amazing. 2 veggies in a cake - got to be good for you but also tastes delicious! 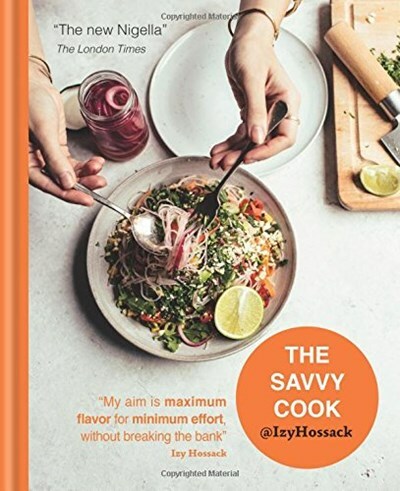 For those cooking for themselves for the first time, or for anyone who wants the weekly budget to go a bit further without sacrificing flavor, cooking sensation Izy Hossack has all the answers. With features that include menu plans, clever alternatives to meat and giving last-night's leftovers a makeover, The Savvy Cook is full of more than 160 nourishing and totally delicious vegetarian recipes that will be kind to your body, wallet and free-time. It's not about health fads, 'antioxidants' or obscure ingredients. Just honest, nourishing and delicious cooking that will make you glow inside and out! Recipes include Berry Oat Smoothie Boxes, Ricotta Gnocchi with Pesto & Courgettes, Lazy Potato Hash and Lemon Blueberry Drizzle Cake. Each recipe also contains a key, making it easy to spot the vegan, dairy- and gluten-free options. From healthy breakfasts to warming suppers, delicious sweet treats to snacks for sharing, Izy shares her favorite recipes that will make cooking easy for the new cook operating on a tight budget and busy schedule.